I thought I’ve seen it all with pinholes. From getting them in walnuts to making a run on three 35mm films. 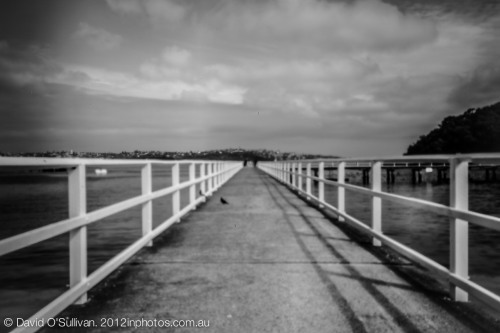 David O’Sullivan proved me wrong with his submission to our How I Took It. 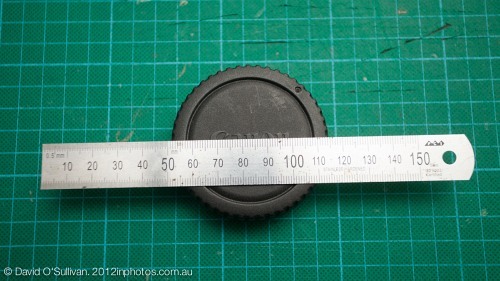 David created a 50MP pinhole camera by cleverly using a body cap. Definitely not how I’ve seen body cap/pinhole combos done before. 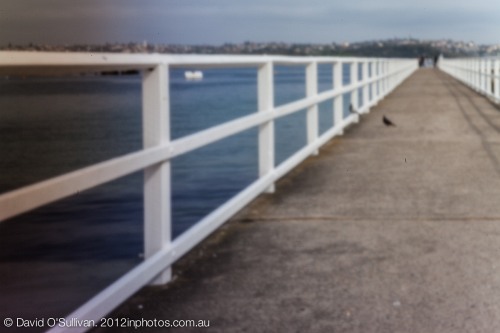 Like many people with a DSLR I have experimented on and off with the ubiquitous pinhole lens made out of a body cap and some aluminium cans. 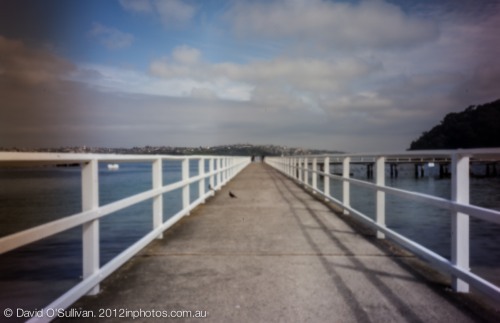 I have always been disappointed with the results as they end up just being blurry photographs and don’t have any of the magic a ‘real’ pinhole does. 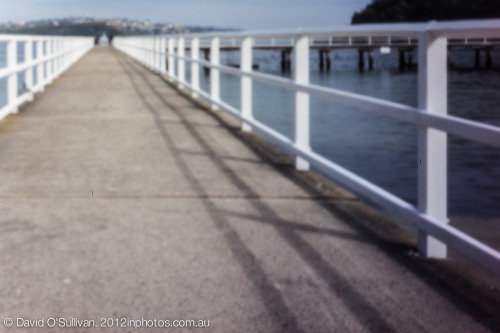 Real pinhole photographs are often very wide angle and have characteristic vignetting around the edges. This imparts a dreamy or other-worldly feeling to the image. I set out to improve on the idea and build my own. I also made a template which can be downloaded from here. There are 4x templates on the one page. You only need one, the others are incase you made a mistake. 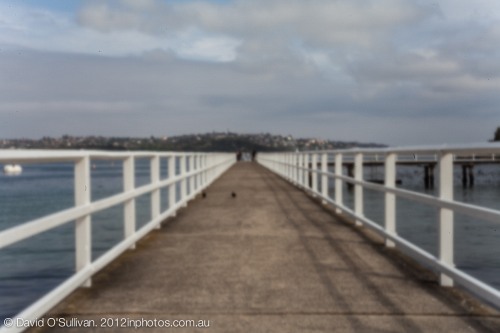 I have not tested this on a crop sensor body, it may need some adjustments but that is part of the fun! 2. 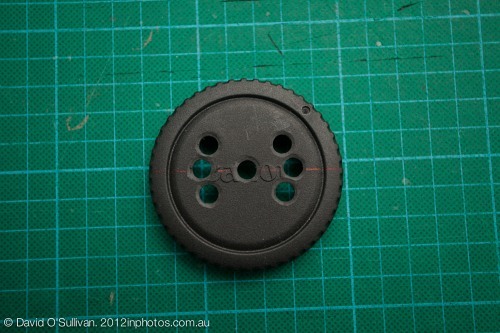 Cut out a circle from the template and centre it on the body cap. 6. Use a countersink drill or an even large drill to de-burr the holes. This can just be hand held. 7. 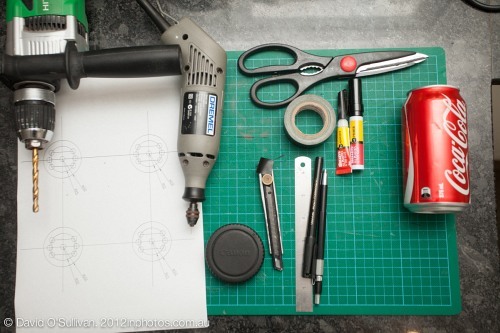 Use scissors to cut a square from an aluminium can. Be careful of sharp edges. Use a marker to mark the circle from the template. 8. 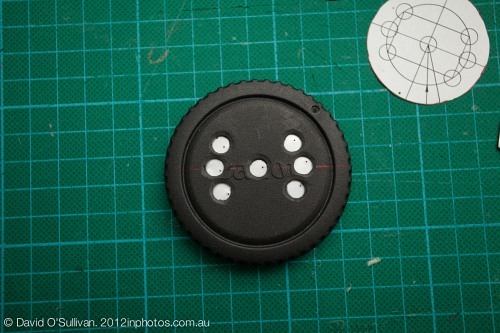 Place the aluminium circle behind the body cap and mark the centre of each hole where the pinhole will be. 9. 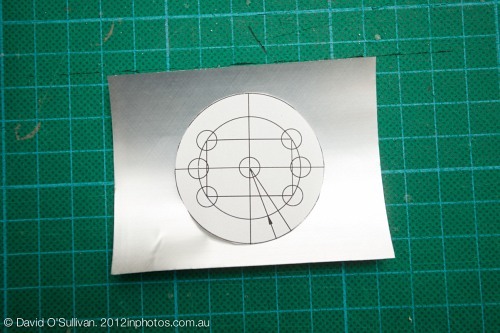 The pinholes need to only just go through the aluminium. They also need to be as round as possible. You can just hold the pin and make the hole, if you have one though I have found my dremel to be very useful with a pin to make the hole. Keep to relatively slow speeds and you should get a very fine hole with very little pressure. Try and make each hole similar in size. 10. 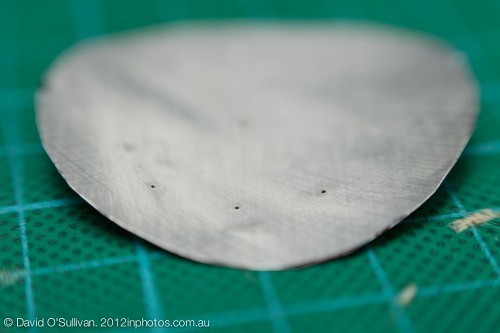 Use fine sandpaper to take the burr of each side of the pinhole. Hold it up to the light to ensure the pinholes are clear. Wipe any dust off the aluminium. 11. 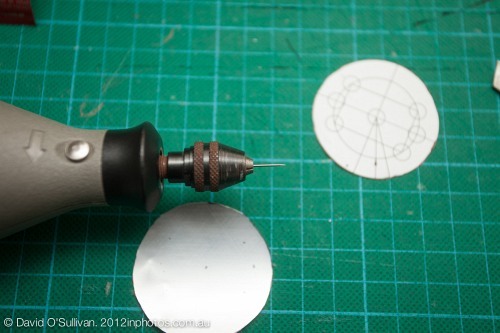 Align the pinholes in the cap and either glue or tape the aluminium down. I usually tape down first and then glue after testing it. Here I didn’t align perfectly but it still works. 12. Make little shutters out of tape covering each hole individually. They can then be removed in sequence to take the photos. Make sure you wipe everything down before attaching to your camera. 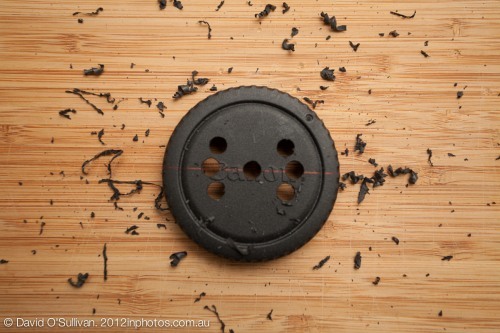 Also if you used glue make sure it is completely dry and doesn’t smell strongly before you attach it to your camera. 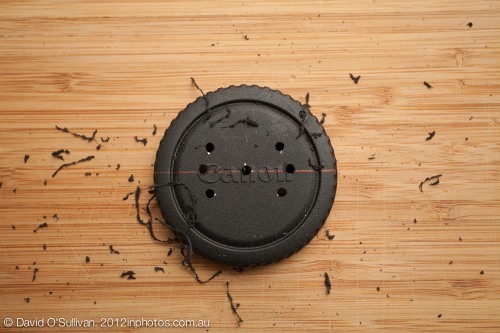 I take no responsibility if you damage anything or get dust on your sensor, so far I have not had a problem with mine. 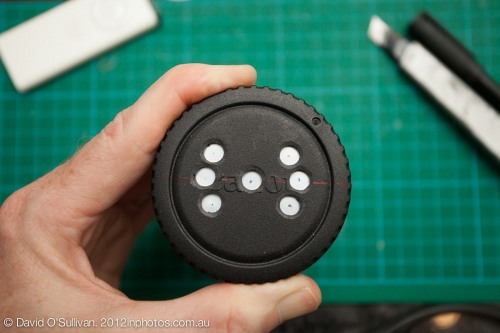 You should now have a pinhole lens with a centre hole and 4 holes around in a square as well as 2 additional holes at each end. 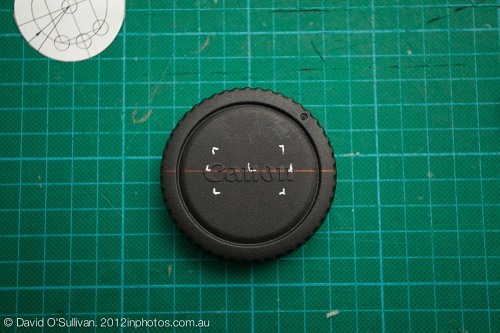 To make a wide angle photo we use the 4 holes in the square as well as the centre. 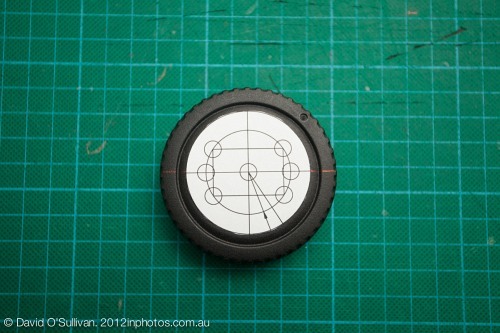 To make a panoramic we use the holes at either end and the centre. 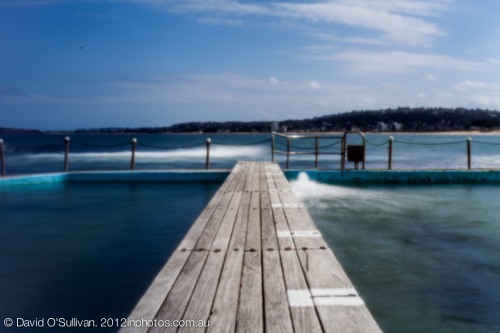 Place your camera on a tripod and put it on manual. 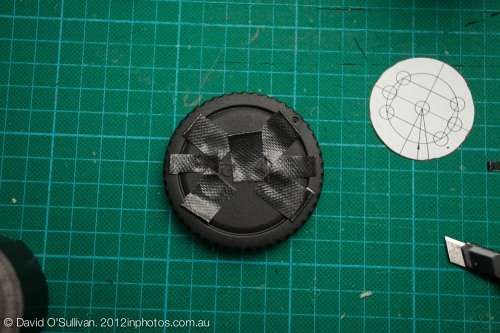 Start at the centre hole and remove the tape. 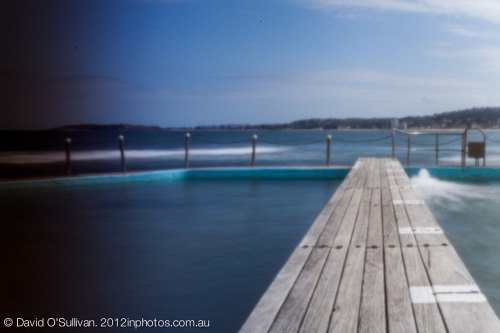 If it is a sunny day you can keep the iso around 100 with a shutter speed of between 0.5 and 1 second. If you are inside or it is overcast you will need to increase your iso or shutter speed or both. Look at the exposure on the back and make adjustments as necessary. Keeping the same setting replace the tape on the centre and remove the top right and expose. Do not move the tripod, the different holes capture different areas of the frame. Continue with top left, bottom left, bottom right. You should now have a series of images like so that cover a much wider area than your original image. I use Lightroom to edit my images and Photoshop to stitch them together. Use whatever you like, I know there are plenty of open source programs like Hugin and Gimp which will do much the same thing.In lightroom I select my images, right click > edit in > merge to panorama in photoshop. As pinholes are rectilinear there should be no distortion. 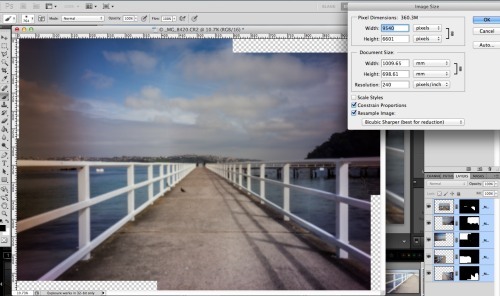 select “reposition” under layout so photoshop won’t add distortion to your image. Let it do its thing and you should end up with a screen like this: You can see that my pinholes were not exactly aligned. 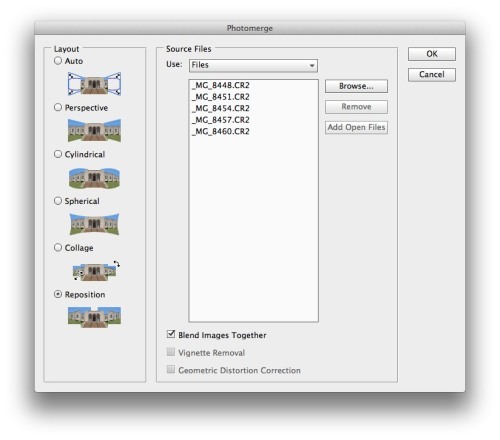 Thats fine, We will just crop the image to our desired size in lightroom. I then resize my image in photoshop using Bicubic sharper to make it more manageable, flatten it and take it back to Lightroom to finish the processing. 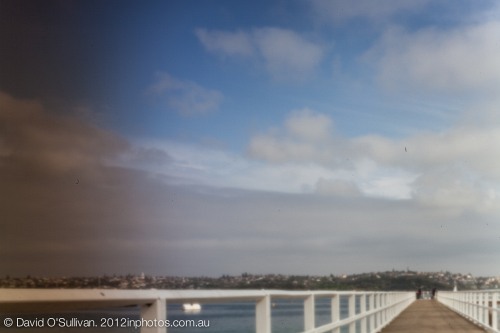 By capturing the pinhole like this you can end up with a 60 megapixel or more image depeding on your camera. You will not be able to enlarge it as much as a photo taken with an L series lens, but capturing it large and resizing it down makes it sharper and much more useable. Do what you like in the processing, I find increasing clarity will make it sharper, and often convert to B&W or desturate it to give it the pinhole look. 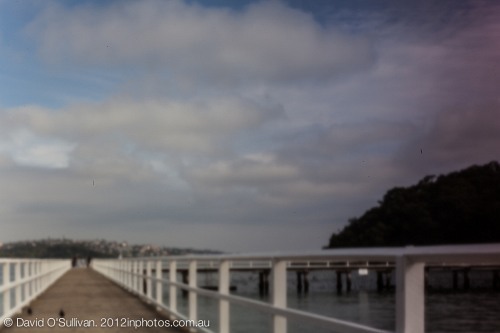 Either way, have fun, shoot lots of images and be prepared for lots of questions from onlookers! industrial aluminum foil (I got some from a restaurant kitchen) is a lot thicker than regular aluminum foil, but still super thin. I think it’s a nice medium between the stiffness of soda can aluminum and the thinness of household aluminum foil. 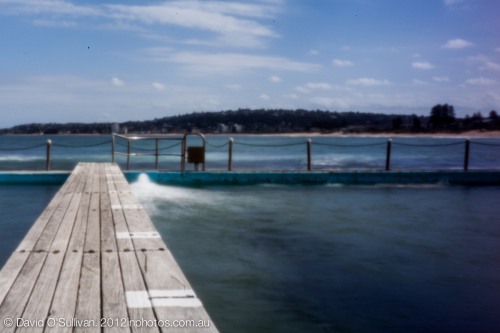 some people enjoy the work of tinkering, and a pinhole lens is fun to play with. not everything has to be tack sharp to be worthwhile. Old post I know, but still relevant. instead of troubling with aluminum from a can, or even foil from the kitchen, use some aluminum foil tape that you can buy at the hardware store, for use in sealing duct work. Sticky back! Stupid mooron.Go get yourself a job.Useless piece of trash.